Seattle Times restaurant critic Providence Cicero revisits The Georgian at the Fairmont Olympic Hotel in downtown Seattle. Suffering from raucous restaurant syndrome? Sick of circling the block for parking and lip-reading across the dinner table? Time to slip into an upholstered armchair at The Georgian in the Fairmont Olympic Hotel, where uniformed staff valet parks your car (complimentary after 5 p.m.), takes your coat and fluffs your linen napkin (a black one if you are wearing dark attire). 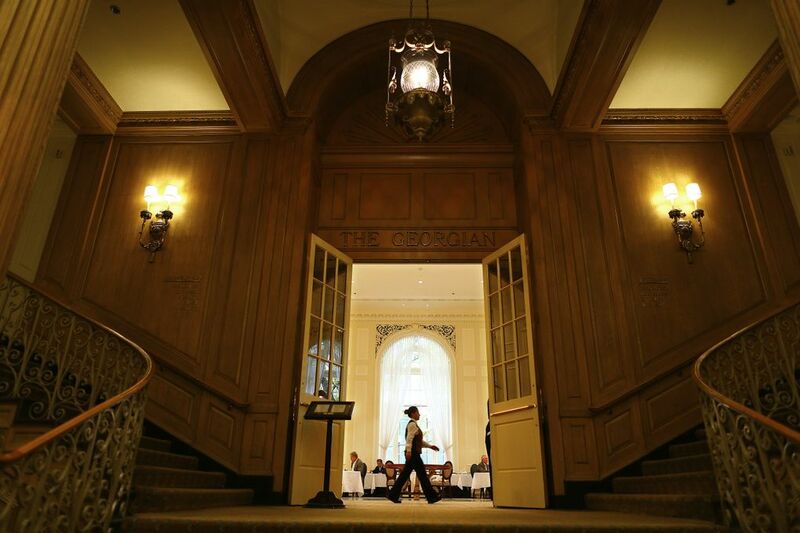 The room has been the main dining salon since the hotel opened in 1924. 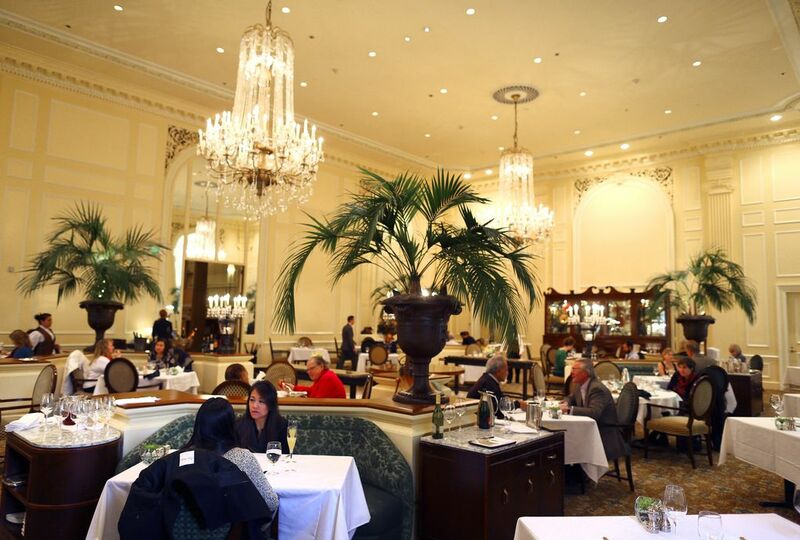 Officially dubbed The Georgian in 1982, the restaurant earned three stars in 1999 when last reviewed by The Seattle Times, six months after Gavin Stephenson succeeded Kerry Sear as executive chef. Stephenson is still there, tending the rooftop beehives and steering a course that keeps The Georgian relevant. 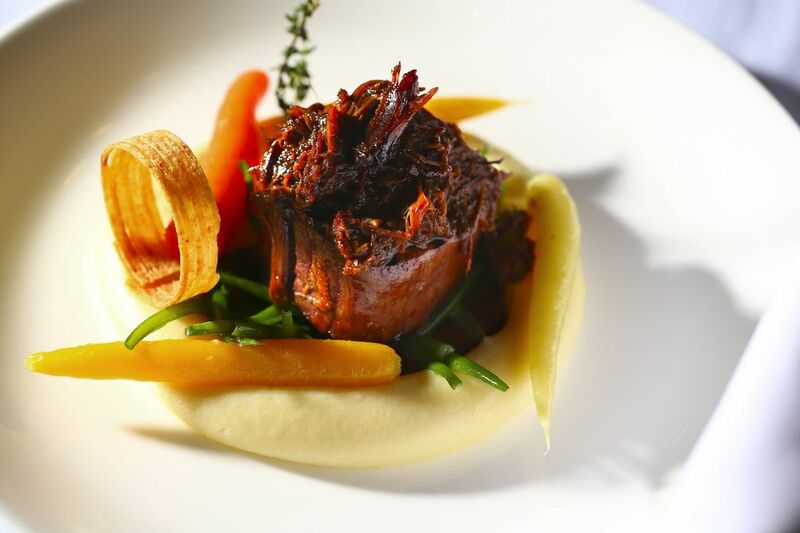 Menus cater to a wide range of dietary needs. Yes, dinner’s a splurge, but the three- and five-course tasting menus at $72 and $99 with paired wines amount to a high-end value meal, while lunch —$15 for hefty Wagyu beef bacon cheeseburger with fries, or a quinoa and chicken chop salad — is competitively priced with comparable venues downtown. 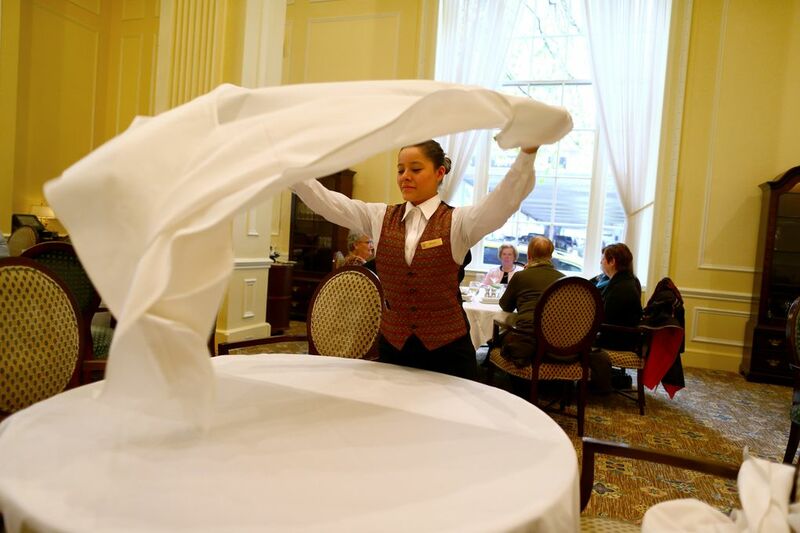 Who should go: “Downton Abbey” devotees or anyone seeking respite from raucous restaurants; dinner’s a splurge, lunch affordable; both menus cater to a wide range of dietary needs. The setting, however, is incomparable: columned ivory walls, marble sideboards, immense crystal-swagged chandeliers that drop from 31 feet above, and potted palms that bow over cozy settees where ladies have tea and lovebirds sit shoulder to shoulder sharing an after-dinner soufflé. Except for afternoon tea, the china is sleek and modern, the tabletops pared to essentials. A silver salt shaker and pepper mill double as a signaling system: separated they let the staff know the table has been approached. Next to a fresh blossom in a crystal vase, a tea light flickers deep in a frosted votive. So complete is the magic spell The Georgian weaves, it never occurs to you the candle is battery-lit. Modern concessions aside, this is luxury on a “Downton Abbey” scale, but The Georgian is not the Dowager Countess of Seattle dining. 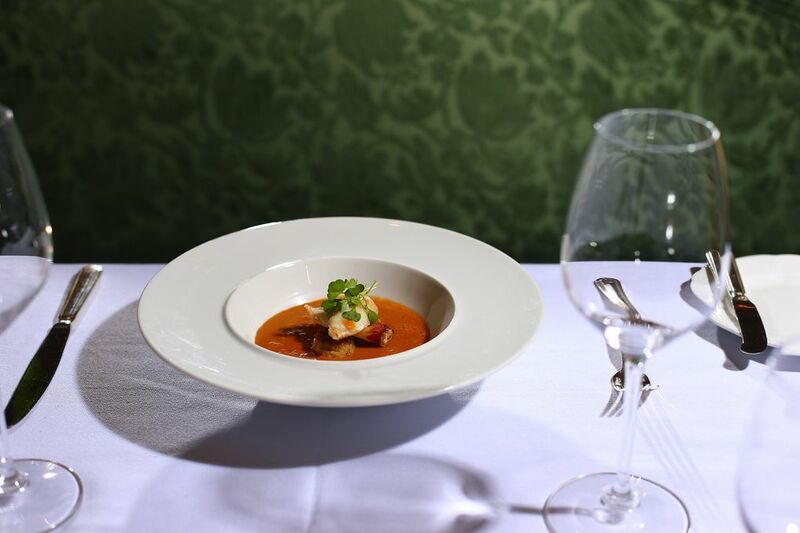 The cooking is classic, the plating au courant. Execution sometimes falters (and I wish vacant tables were tidied and reset at dinner even if they don’t expect another turn), but those aren’t fatal flaws. A sticky stream of honey-bourbon sauce trailed tender slices of seared Muscovy duck breast and truffle-scented black trumpet mushrooms, paired with crisp little packages of prosciutto-wrapped duck confit and savory beluga lentils stewed with red wine and mirepoix. Pickled cauliflower, maple smoked bacon and vodka foam pierced the briny richness of squid ink risotto, a cushion for roasted black cod. 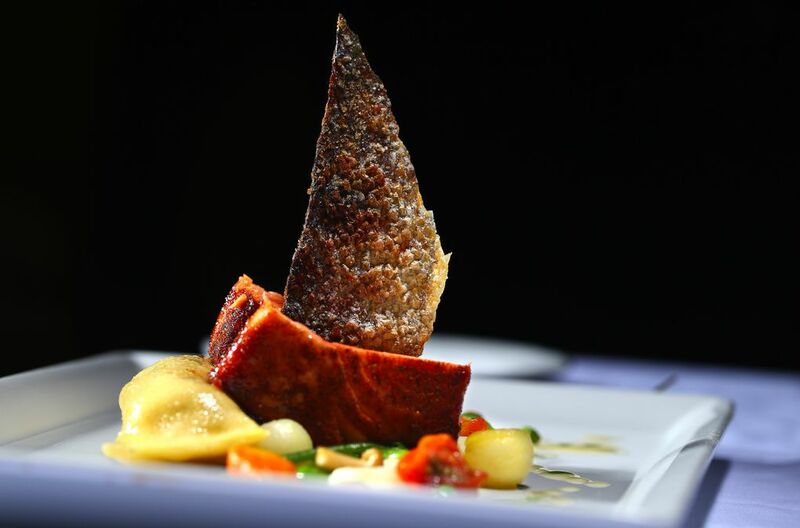 King salmon, lightly smoked, slightly sweet and “pastrami-spiced” with allspice, cinnamon, clove and cayenne is superbly tricked out with crackly, salty fried salmon skin and a multitude of little vegetables. It’s among the best salmon preparations I’ve had anywhere, but an ill-wrought cannelloni with it is like a beached whale — heavy pasta enveloping crabmeat and a whole, giant, overcooked Asian tiger prawn. Courses are downsized a bit for the tasting menus. Thus a doll-sized beet salad preceded a six-ounce, precisely cooked Angus beef filet, topped with braised oxtail and shallot, plated with carrots and green beans tucked into a wreath of potato purée. Wines paired with the tasting menus are good for their price range and generously poured. The bottle list, curated by longtime wine director and Master Sommelier Joseph Linder (now a consultant), emphasizes the Northwest, but spans the world, mixing trophy wines with more affordable selections. Details frequently delight. Evening bread service includes delicate lavash with four flavored butters; at lunch black olive tapenade came with sun-dried tomato focaccia and fresh potato chips. A tiny deviled quail egg with a dot of caviar delivered on a silver spoon was one night’s amuse-bouche. A plate of local goat cheese came with a pipette of rooftop honey for drizzling. Brioche Melba toast and a long sheet of aged pecorino accessorized a sculptured romaine wedge that wears its Caesar dressing like a luxurious shrug. 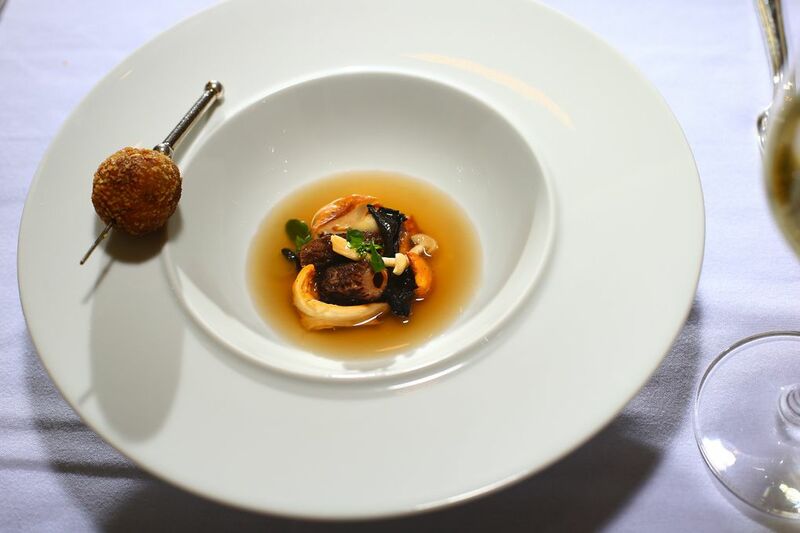 A duck-fat-fried foie gras and truffle bonbon on a silver toothpick accompanied morel mushroom consommé, poured into your bowl at the table, as is the excellent, brandy-laced Dungeness crab bisque. The soufflé of the day is a fine way to end dinner. But executive pastry chef Artis Kalsons and his team create even fussier finales, like Brûléed Cocoa Nib Financier that layers crackerlike cake with chilled hazelnut cream, or the OMG (Oh My Georgian) devil’s food cake, a chocoholic’s dream come true. 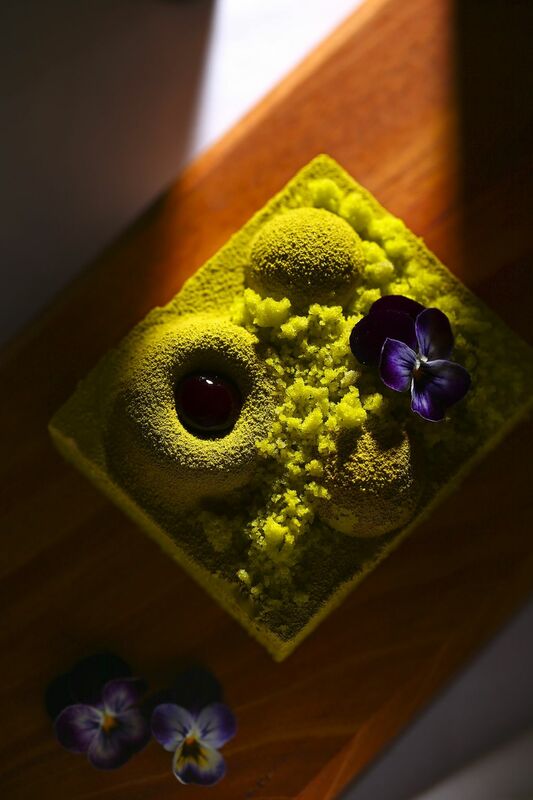 Around 5 p.m. in the hotel lobby, you may encounter dinner pastry chef Chloe Lee with her creations, tempting people into the restaurant. If I haven’t convinced you to try The Georgian, perhaps she will.